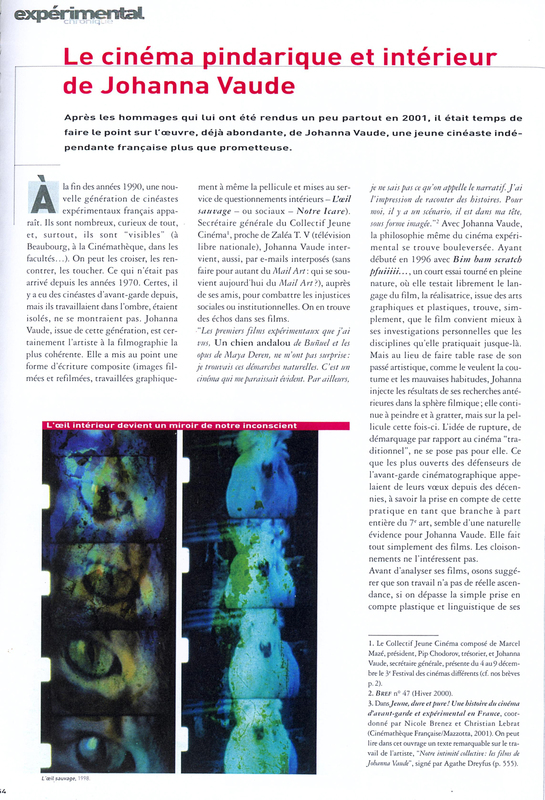 Cet ouvrage présenté sous forme d’abécédaire, apparemment composite, est à̀ parcourir comme le journal de bord d’un cinéphile, amateur de cinéma expérimental qui, au gré des époques et des supports, au gré des programmations, a tracé une voie (à poursuivre et à élargir) proposant des approches du cinéma d’avant-garde et expérimental. 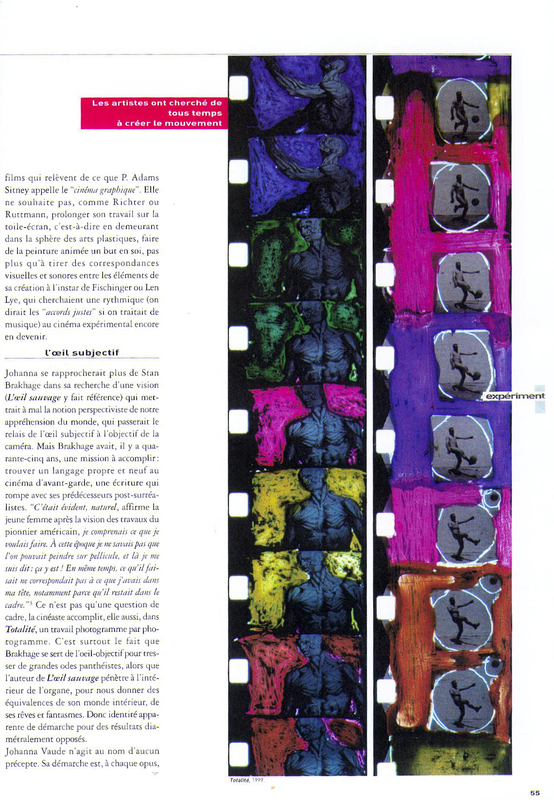 « L’art de l’hybridation selon Johanna Vaude » par Raphaël Bassan in « Zeuxis » n°25 (15 septembre), p 31, 2005. 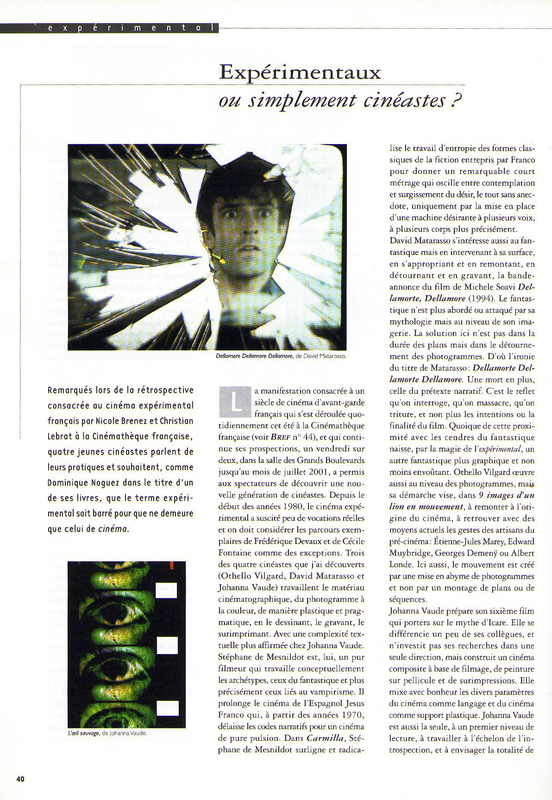 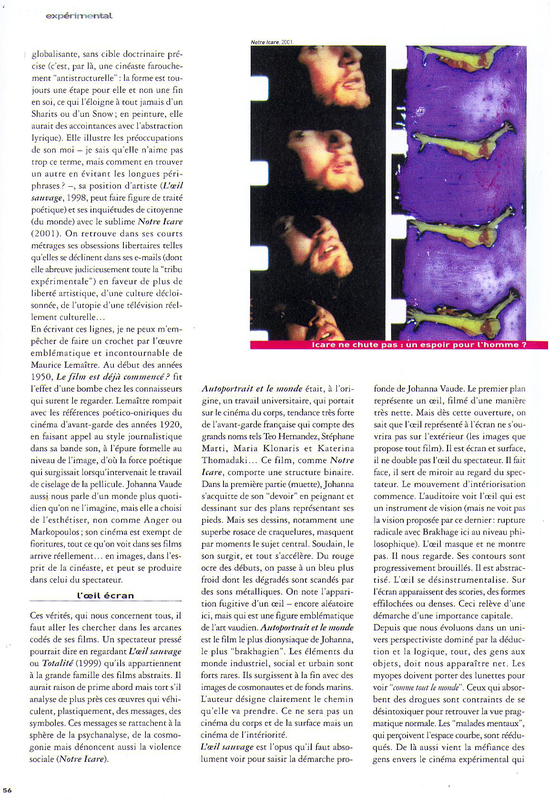 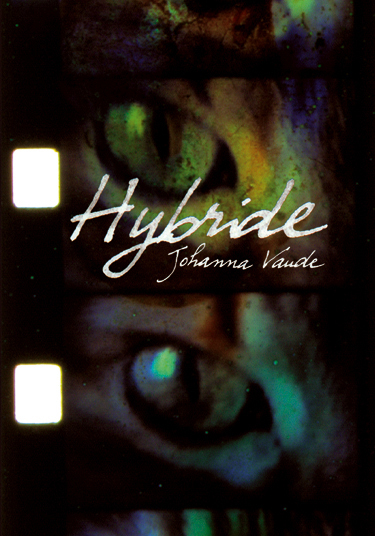 « The filmmaker Johanna Vaude, who realized certain experimental masterpieces of the last ten years (L’œil sauvage (Wild eye), on 1998; Notre Icare (Our Icare), on 2001), presents us, within the framework of the sessions dedicated to the avant-gardes by Nicole Brenez in the French Film library, of a programming in the form of a programming in the form of reflections multiforms on one of the major axes of experimental media(audiovisual), that of the hybridization inter-supports (argentique, digital, photos). 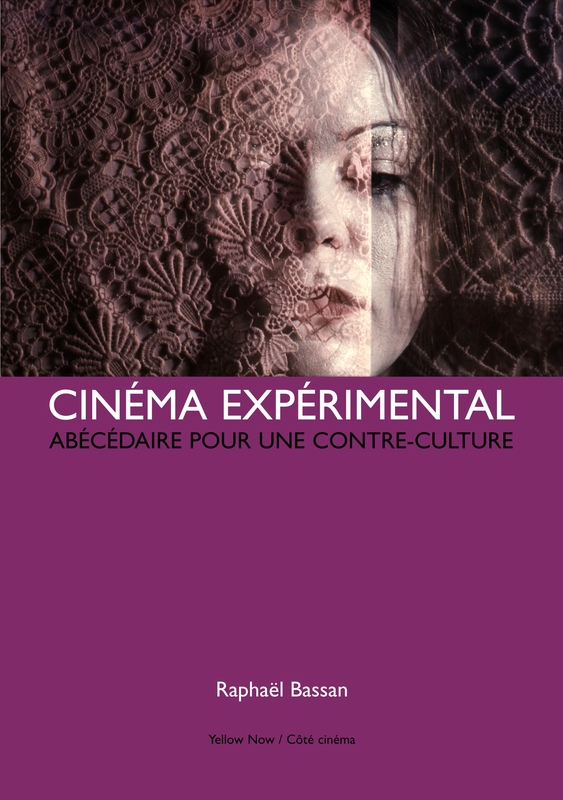 This program, which covers (one Friday evening on two) September and October, is divided into three axes which are so many visual and theoretical propositions on the subject. 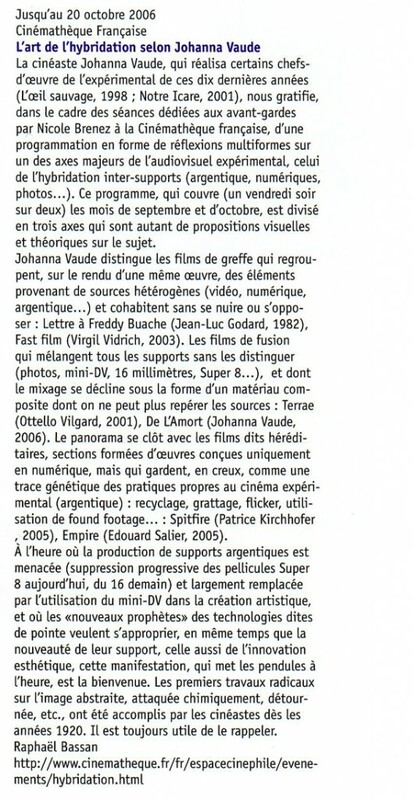 Johanna Vaude distinguishes the films of « transplant » which group together(include), on the depiction of the same work, elements resulting from diverse sources (video, digital, argentique) and live without damaging itself or opposing : Letter to Freddy Buache (Jean-Luc Godard, on 1982), Fast film (Virgil Vidrich, on 2003). 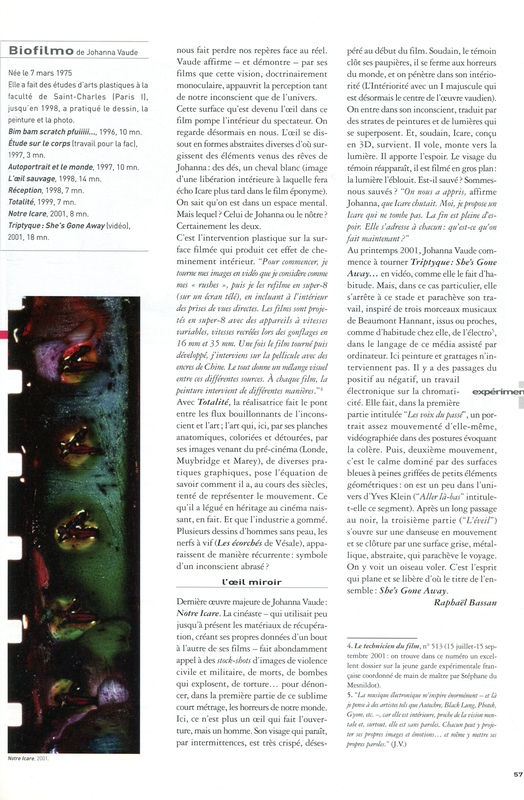 The films of « fusion » which mix all the supports without distinguishing them (photos, mini-DV, 16 millimeters, Super 8…), and whose mixing declines under the shape of a dissimilar material sources of which we cannot track down any more: Terrae (Ottello Vilgard, on 2001), De l’Amort (Johanna Vaude, on 2006). The panorama closes with the « hereditary » said films, the sections formed by only digital conceived works, but which keep, in hollow, as a genetic track of the practices appropriate for the experimental movies ( argentique ): recycling, scratching, flicker, use of found footage : Spitfire (Patrice Kirchhofer, on 2005), Empire (Edouard Salier, on 2005). 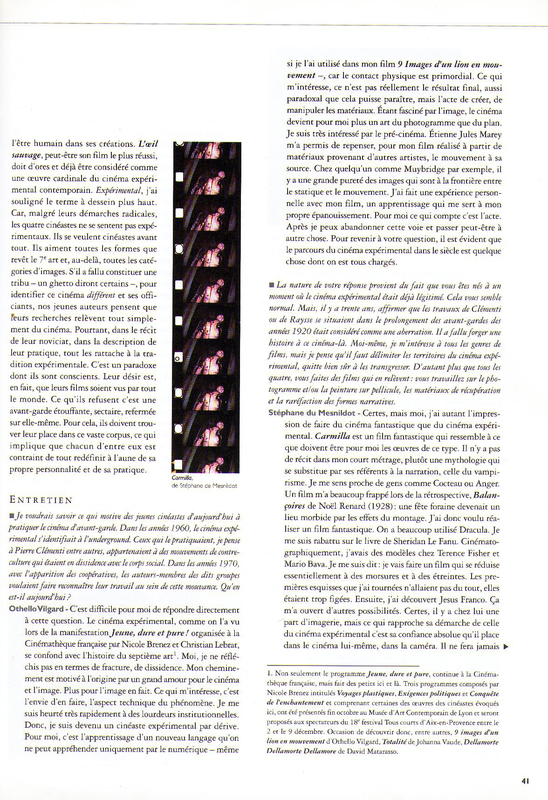 Cinémathèque française (French Film Archives) until 20th October. 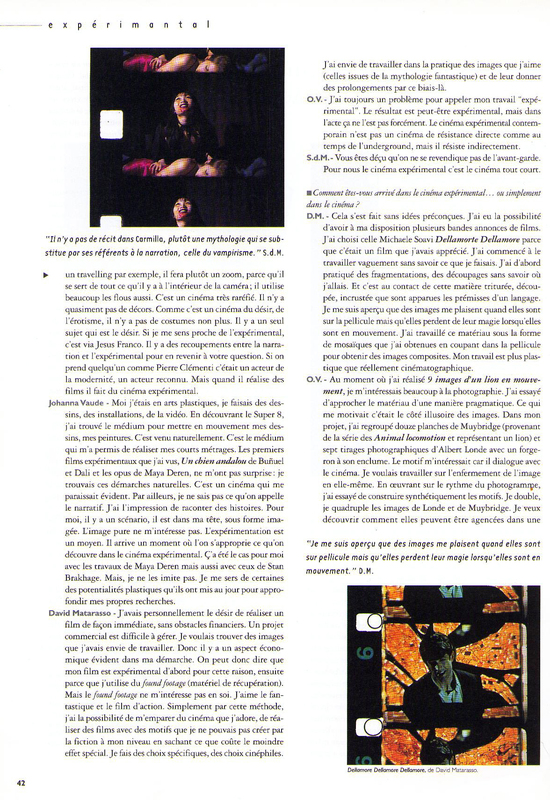 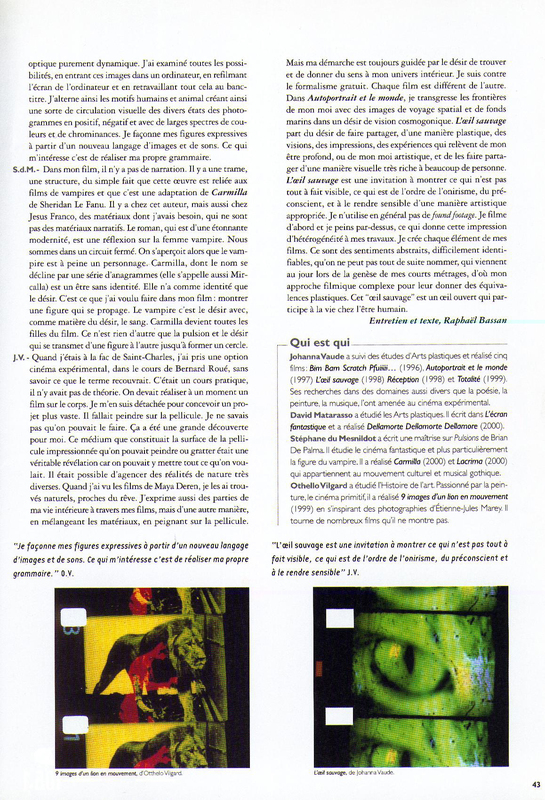 « L’art de l’hybridation selon Johanna Vaude » par Raphaël Bassan in « Zeuxis » n°25 (15 September), p 31, 2005.